Linzi Upton - The Quilt Quine, married with 3 children, lives with pets and hens in rural North East Scotland. 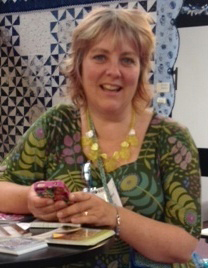 She is a qualified but seldom practising primary school teacher and award winning longarm quilter. Linzi has exhibited in the UK, The Netherlands, Hungary, and the USA. Articles and projects have been published in British, German and American magazines. She is best known as the creator of Quilted Yurts. She followed this major project with a series of metallic Norse quilts, a Quilted Coracle and Smart Car cover. Other installations include the Quilted Henge comprising 12 Celtic seasonal columns featuring freestyle piecing, spandex, leather and gemstones. She explored images projected onto quilts and used clothes rope instead of wadding with her Domestic project.